Painting. Rain. Puddles. YUCK. Even though it’s great for kids to have access to these things, I HATE DOING WASHING. So I am often loathed to set the activity up, just for the mess factor. I have found a solution – COVERALLS!!! Mud Mates are a New Zealand owned and operated business and have amazing Coveralls, Overpants, Craft Aprons & Shoe Covers that you can purchase. They are designed to protect your children’s clothes, keeping them clean and dry through all sorts of messy play and outdoor adventures. The products are also made in New Zealand. WE ALL LOVE NZ MADE!!! We had the red Coveralls and my daughter was instantly taken by them. 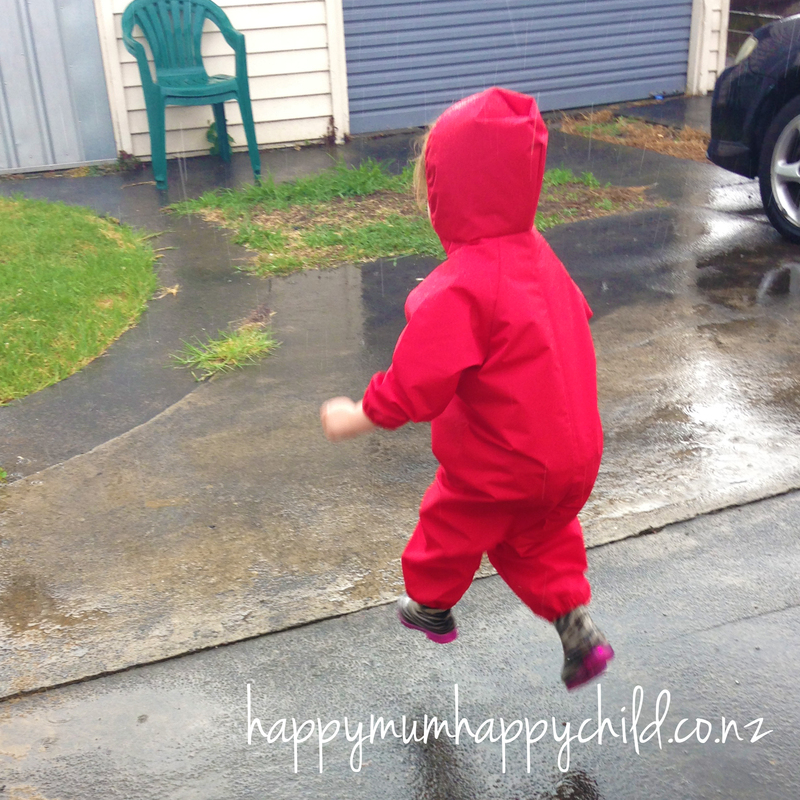 Putting them on was super easy, and we just added our own gumboots at the end. Afterwards, I simply hung the Coveralls up and let them dry. TOO EASY! The Coveralls themselves are actually machine washable, so if you did get all kinds of weird and funky things on it, you can simply pop it in the wash. I have honestly been meaning to get a pair of Coveralls from Mud Mates for such a long time, and I can say I was not disappointed. I would recommend (and already have!) to any Mum. I am a big worry-wart and really hate doing washing (who doesn’t!? ), so if I can keep my kid warm, dry and mess-free, then fantastic! Coveralls come in a variety of colours, and range in sizes from 6 months to 3 years. They are priced at $40 each. You can purchase these from the Mud Mates website (along with the other Coveralls, Overpants, Craft Aprons & Shoe Covers). 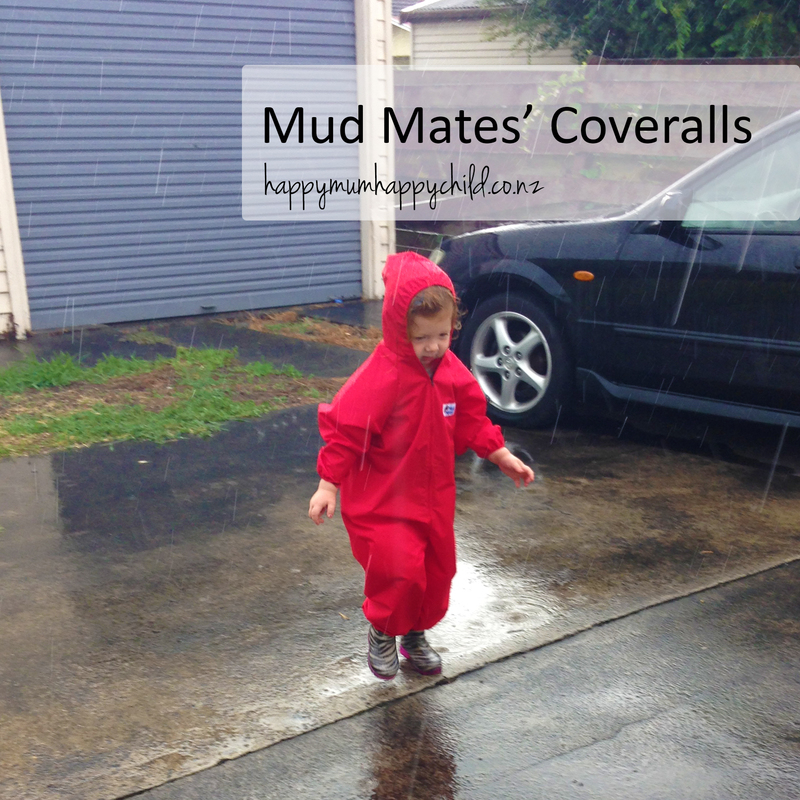 Alana from Mud Mates has graciously offered Happy Mum Happy Child readers $5 off a Coverall purchase – just enter the code HAPPY when checking out. This is valid until Wednesday 8th April 2015.